While “bib swapping” may seem harmless, or even common, it poses issues for race safety, stretches resources and perpetuates an unethical practice. 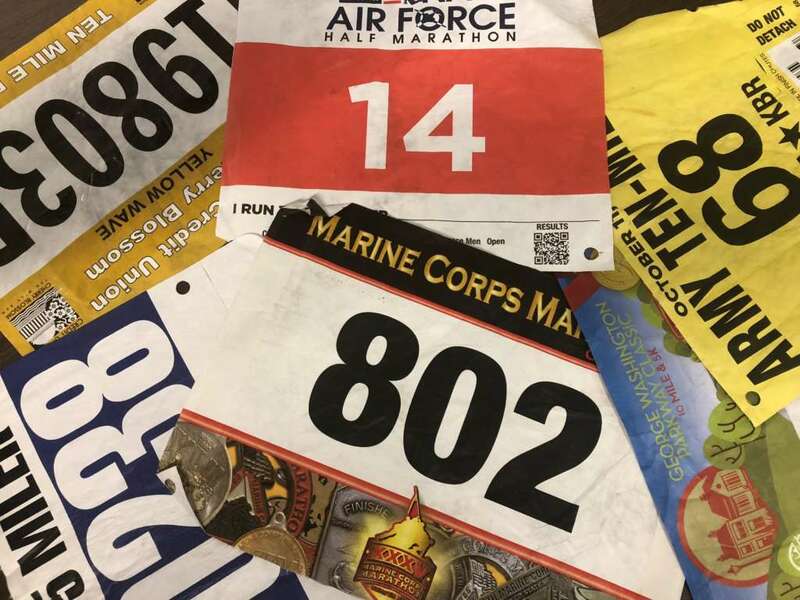 Most races prohibit running with someone else’s bib unless it has been formally transferred — name, emergency contact information, waiver and all. A few of the larger local races have established formal timeframes for these kinds of transactions. The Cherry Blossom Ten Mile has an online bulletin board where Race Director Phil Stewart estimates about 1,000 people each year post bibs they aren’t using and connect with people who want to run for a small fee. The Marine Corps Marathon also allows transfers or deferrals. Race Director Rick Nealis said about 5,300 people have either deferred or transfered their registration for the 2018 race. People give their bibs away for any number of reasons: life events interfere, travel plans don’t pan out, injuries arise or training comes up short. So many people may wonder, “if I’m not setting a course record or causing too much commotion, is it really that big of a deal to pass off my bib to another able-bodied runner?” It can be, Stewart said, especially considering the potential for a medical emergency. “It’s very important for the race director to be able to identify every runner in the event, and the medical reasons are most pressing,” he said. “As soon as a runner swaps a bib, you no longer know who that runner is. There is no way to track down friends or family in an emergency. Another common issue occurs when people do, in fact, bestow their bibs to people who dominate their age group or set records. It “obviously it creates complications with results,” Stewart said, adding that every year, up to five age group awards have to be nullified after staffers discover someone ran Cherry Blossom under a different bib. Derek Murphy, who spearheaded Marathon Investigation a little more than three years ago, said malice is often at the root of the cases he scrutinizes. Murphy, who uses his blog to track down cheaters in the racing world, has uncovered hundreds of cases of bib swapping, including some where people passed their bib on to runners under the guarantee they would qualify for the Boston Marathon in their name. Additionally, Murphy found cases where people had runners compete in their bib so they could get a preferred corral placement at another race, he said. In 2016, Murphy probed the Boston results and found that a group of people who all ran between four- and five-hour marathons had qualified with two-and-a-half hour marathons. He looked into that jarring discrepancy and found out they were all members of the same running group and one of its members ran BQs for the others. An increase in bib swapping? About 300-500 people are bib swapping for Marine Corps, Nealis estimates. And while that is a small fraction of the roughly 30,000 people who run the race, there is the potential for that number to increase, he said. Sites like Craigslist and certain Facebook groups can breed bib swapping. The increasing cost to run races is driving some people to bib swap, Stewart said. As race entry fees reach hundreds of dollars, runners may be more inclined to want some of their money back if they can’t run. “If it’s a less expensive race, a $20 entry free, people may say ‘I understand I’m hurt, it happens.’ But I think when you’ve invested three or four times that amount, it might sting more, and it may make you think more about selling your bib,” Stewart said. It’s difficult to get a count on the number of people who bib swap since so many of them go undetected. Still, perception of the practice is largely negative in the running community. A 2016 Runner’s World survey found that 84 percent of the more than 17,000 respondents were against bib swapping. And while some runners may be opposed to it, others are seemingly oblivious to the fact that it may be frowned upon. Julie Sapper and Lisa Reichmann, coaches for Run Farther and Faster, hear their runners bring up available bibs all the time, and use the conversation as a teachable moment. “They’re situations where people just don’t know the rules,” Reichmann said. Sapper said she feel comfortable speaking up on social media when someone puts out a call to either acquire or unload a bib. “People use social media to make bib trades happen, but that’s also where they can be caught,” she said. Large races rely on a certain no-show rate — that is, people who will register but never show up to the event. Events like the Cherry Blossom 10 Miler have a 20 and 25 percent no-show rate and rely on that number to anticipate race-day needs: water, Gatorade, T-shirts, medals and volunteers. Bib swapping throws off those no-show numbers, Stewart explained. The race’s permits with the National Park Service call for a certain number of finishers, and any deviation from that could threaten the permit in a worst-case scenario, he said. “Our no show rates are steady enough that we do so with confidence … now we go on the lower end of the no-show rate,” he said. Likewise, Marine Corps allows for 30,000 finishers, but allows thousands more through its lottery system every year. That’s because roughly 6,000 people who registered and paid for the race won’t show up on race day, Nealis said. As bib swapping becomes more commonplace, Nealis said race directors need to have a plan and be less reliant on no-show rates. “Don’t put your head in the sand and say they’re not there. Because they’re there. So you have to have some extras to accommodate,” he said. Murphy’s investigations have led him to the thought that bib swapping may not be happening more, but rather more people are aware of it and more inclined to report it when they spot it. Serving justice is at the heart of Murphy’s passion for looking into cheaters and bib swappers. Regulating and punishing bib swapping can be a challenge, and race directors differ on how to discipline the offenders. For Cherry Blossom, the buyer and the seller are both banned from the race for two years. Marine Corps has a one-year ban associated with bib swapping. Often that pertains to runners who get nabbed if they reach the awards podium, Nealis said. Outside of that, Nealis said tips come in about bib swappers long after the race has ended and he deals with those on a case-by-case basis. Most, however, are swept under the rug due to the “sheer number of runners and resources needed to investigate every case,” he said. It’s important to try to glean the runner’s intent when determining the consequences, Murphy said. Some cases are innocent enough, “but there are many cases where runner should be banned for life,” he said. Murphy found one such case few years ago when a runner posted online that he would sell his bib for the California International Marathon … and would pay the recipient extra money if a Boston Marathon qualifying time was achieved. After his investigation, the California International Marathon banned the runner for life. A future without bib swapping? “To say that you could keep bib swappers or bandits off a course is impossible I would think,” Murphy said. However, certain tactics can help keep them at bay, he added. Some races employ wristbands that are distributed to runners at registration or expos. Runners without wristbands can’t get to the starting line, he said. Other races diligently check bibs in the last mile or so, Murphy said, pulling off people who don’t match. Nealis said a technique like that is too cumbersome with races like Marine Corps. “With so many coming across finish line, it can be so tough to keep track of,” Nealis said, adding that while bib swapping is an issue, there are about five-10 runners each year who Xerox a bib and run the race. They may be the more pressing rulebreakers to catch, he said. Nealis said he hopes technological advancements with chip timing will help flag cheaters in the future. It would be a situation where as people come across the mat at the finish, the chip timers will be able to immediately do calculations and flag instances where “something isn’t right,” he said. Many races have offered insurance for entry fees which can help quell some bib swapping. Cherry Blossom has offered it for a few years, and while Stewart said it may help give runners piece of mind, it may not put an end to the practice.